Just Jingle: Simon Says Stamp Challenge: Olympic/Patriotic Inspiration! Simon Says Stamp Challenge: Olympic/Patriotic Inspiration! We have a brand new challenge for you over at the Simon Says Stamp Challenge Blog! We are creating cards this week with the Summer Olympics in mind! The challenge is to create a project a sporty or a Patriotic theme! YAY! Of course, there is a fabulous prize being offered by Simon Says Stamp, so you will want to join in the fun!!! I created this fun patriotic card using the fabulous Seeing Spots Cuttlebug folder and the Hero Arts Hooray stamp set for Studio Calico. I LOVE these stamps! 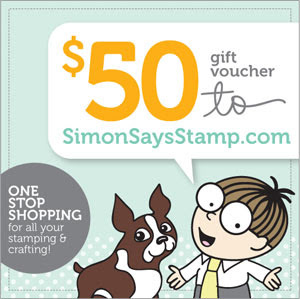 One winner will receive a $50 voucher to Simon Says Stamp! 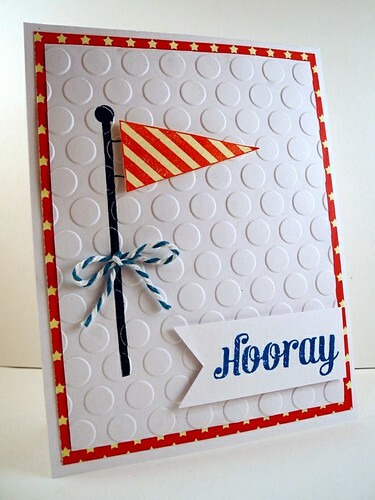 So head on over to the Simon Says Challenge Blog and link up YOUR sporty or patriotic card! 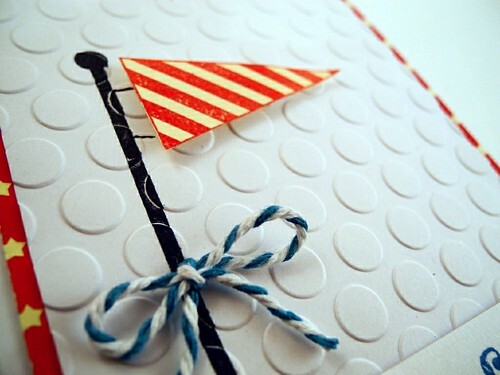 LOVE it - have not seen those big dots before, but they are so effective with this fun design! LOVE!!!! I'm enjoying your work. Thanks for sharing. Super cuteness dearie!!! I might have to hit up that challenge really soon!!! This is so cute! I love the CAS look it has. Super fun card! Love the little flag! Hi Jennifer, such a brilliant CAS card, I do wish I could do that!!! The 'Seeing Spots' folder look stunning - I shall be treating it with more respect now!! Your details and colours are fab. This is awesome and so fun! Great to see you using Hero Arts stamps! Wonderful card! Love how you incorporated stars and stripes but in a subtle way! Just love your card Jennifer!! So beautiful!! Congrats on making it to the Final Round of Gallery Idol!! You should feel very proud and rightfully so!! You ROCK girl! !